Lightning struck near the house yesterday afternoon, and the shock wave felt like a big foot coming down, while the windows rattled and buzzed. 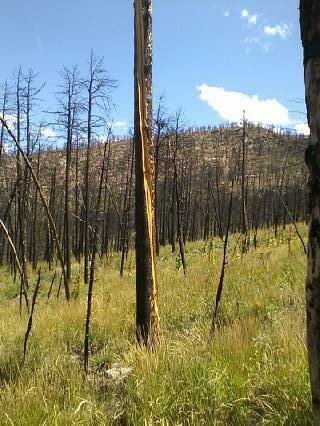 The incident reminded me of this cell phone snapshot from last month, taken up on the 2012 burn — one of two recently lightning-struck tree trunks close together. Both were already dead, of course. Keeping me eye out for anther blasted tree like this one, closer to home. Try being in the car on the highway when it is hit by lightning. (Outside of Pueblo on I25) Very bright and pretty loud. Means you can count on 7-8 weeks of car repair and $8000 worth of repair bills to replace all the electrical. Or being in the car stopped at a light. Whitest light I have ever seen but only resulted in needing new front tires. Lightning is not my friend. Wow. You must have had good auto insurance!